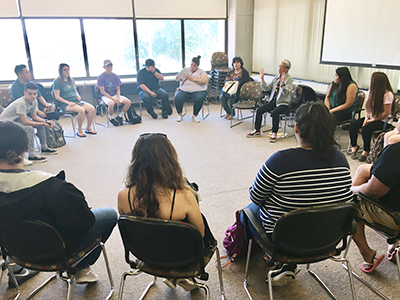 The ethnic studies program at Stanislaus State presented the second annual Ethnic Studies Conference themed “Community Power in the Central Valley” on May 14. Students, faculty, staff, alumni and community members gathered to discuss social justice and education. The free one-day conference included creative workshops, performances and educational panel discussions with leading experts. Through critical dialogue, attendees were given the opportunity to learn about the growing movement to support ethnic studies education in the Central Valley and Bay Area. “We want to make sure students have the opportunity to gain knowledge of the scholarship, research and theories of ethnic studies, social and cultural diversity, the history of exclusionary practices in the United States and how they can advance us as a society and as a nation,” said Stanislaus State President Ellen Junn. By participating in Conference workshops, students were able to explore and dive deeper into various issues surrounding diversity on campus and the positive impact of having supportive community inclusion through campus clubs, forums and faculty mentorship said Marissa Gonzalez, a liberal studies student. The importance of the Ethnics Studies Conference is also reflected in the opportunities that students have to explore and learn about the lives and intersectionalities of the people in the Central Valley in a way that brings diversity and inclusion to the campus said Natalie Vargas, a 2017 sociology alumna. By welcoming events, such as the Ethnic Studies Conference, Stan State fosters an environment that connects people with experts in the field, creating a platform that excites individuals to engage with one another, work for social change and enhance their own personal progress in positive ways. At the systemwide level, the California State University Task Force on the Advancement of Ethnic Studies was formed nearly four years ago to support and encourage the community to engage in constructive dialogue and to enhance mutual understanding. Junn was a member of the task force. “We’re a very diverse campus, in terms of our student body, and one of the first things I did when I arrived as president was to establish the President’s Commission on Diversity and Inclusion for Stan State,” she said. The Commission is finalizing an institutional Diversity and Inclusion Action Plan  to address campus, climate, curriculum, hiring and community partnerships. Last year, Junn announced that funding had been allocated to restore two tenure-track ethnic studies faculty positions and bring the ethnic studies program back to its original faculty base. Students who participated in the Conference were empowered to take action and join organizations such as Central Valley Freedom Summer, a community-action research project. By promoting the message of unity and inclusion, the Conference strengthened the importance of getting involved to have a positive impact and how the University and local community can stand together to overcome adversity.